Wolfram Alpha is online for testing throughout the weekend, in anticipation of the online knowledge base officially going live on Monday. Although the launch team warned in the Wolfram Alpha Blog that the site may go down periodically throughout the weekend, anyone has a chance to check out how well it answers fact-based questions from its database of information organized by Wolfram Alpha staff. How well does it work? Well, it was able to find quickly how many calories are in a serving of cocoa puffs, what day of the week I was born on, and PC World's circulation. Entering "Star Trek" automatically pulled up the J.J. Abrams film and told me it was released 0.022 years ago. 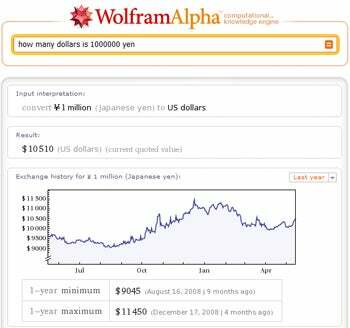 Besides providing information on search terms, Wolfram does a great job at conversions and answering equations. I was able to convert the value of my pocket change from dollars to yen and figured out what a 20 percent tip would be for a $25.86 meal and how to break that tip up into currency. 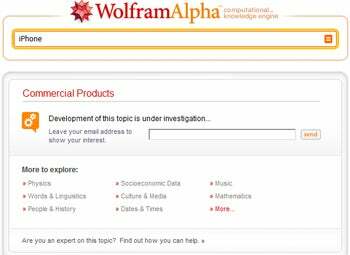 At the bottom of the page you can take a look at the sources Wolfram has drawn from to answer questions about your topic, or save your results as a PDF. The PDF is basically a reproduction of the Web site; it would be nice if it was reworked in the future to be more printer-friendly. I was quickly impressed with the site's capability to return relevant information about my search terms just as fast as Google would refer me to a list of indexed sites. I couldn't help but try to push Wolfram to its limits. I started simple. I entered: How old is the oldest person? After I pressed enter, the logo above the search bar animated to show the site was churning through information. In less than a second, Wolfram gave me the name Jeanne Louise Calment, the oldest person ever recorded, who is 122.45 years old. It then broke that time down into days, centuries, seconds, anomalistic, and sidereal years. Throughout the process I would occasionally get an error message from the site: "I'm sorry Dave, I'm afraid I can't do that..." to notify me that the site has exceeded its test load. The amusement of the "2001: A Space Odyssey" reference wore off after seeing it numerous times, but I was typically able to resume searching within a few seconds of receiving the message. As I continued to use the site it seemed Wolfram performed nicely, but when I asked it how much money Star Wars Episode 1 made its opening weekend Wolfram wasn't able to provide results. After a second of "thinking" it recommended the search term "Star Wars Episode 1." I clicked and it brought me to a page that displayed the movie length, cast, release date, and total box office numbers, but not the totals for opening weekend. It seems at the moment Wolfram is better at directing you to information if you stick to search terms instead of questions. And unfortunately for PC World readers and tech junkies alike, product information is not available yet. Instead of leading me to a well-laid-out spreadsheet of juicy rumors, my search for iPhone brought me to a page that said "development of this topic is under investigation." A search for Blackberry Storm led me to two pages: one about food and the other about meteorology. All things aside, Wolfram Alpha is performing nicely, considering this is a test weekend. The tool may be able to better address some of my more abstract questions in the weeks to come. If you haven't gotten a chance to visit Wolfram yet, do it now. Let us know what you think.